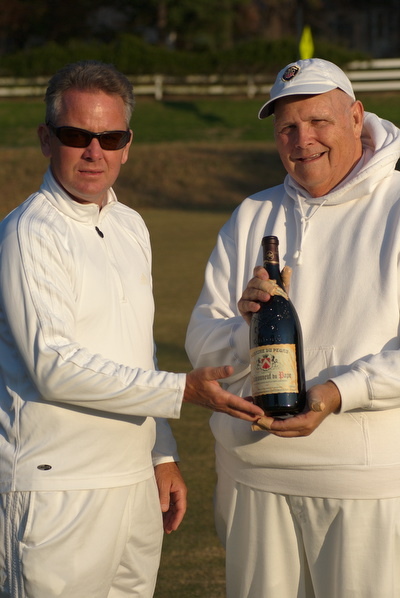 Stoneridge Croquet Club’s seventeenth annual club championship was played as a handicap tournament. The format was a simple knockout with plate (consolation) games on the side. Tommy Harrington, playing off 5, beat Conrad Haas (5) 22-10, then beat Jeff Soo (-2) 26-2, not letting Soo take croquet and using only three of his seven bisques. This put Harrington into the final against Frank Thompson (2.5), winner over Marie Haas (5) 26-13 and Andy Short (0) 12-9. Harrington won the final 26-5, his half bisque still standing. Soo won the plate by winning four out of five games. Bob Roth (10) earned an honorable mention by beating both of the finalists in plate games. The revised bisque rules (2006 edition of the USCA rulebook) proved their worth by the many close games at all handicap levels. Every player won at least one game and lost at least one game. Of the seventeen games involving bisques, eight were won by the player receiving bisques and nine by the player defending against bisques. Paul Scott did not play, thus continuing the Stoneridge tradition of not letting the national champion win the club championship. This has now occurred five of the six times a Stoneridge player has won the USCA American-rules singles title, starting with Mack Penwell in 1993.